Jill, my older sister, is not as culinarily disposed as the rest of my family. She likes cooking now more than she used to, but where the rote parts of making a meal—cutting, mixing, and stirring—provide me an entrance into a nearly meditative state, for her, they are a little dull. For whatever reason, she does seem to enjoy cleaning up the kitchen after we’ve made a feast that uses every pot and pan and sullies every possible counter top. Even more than cleaning, Jill likes designing meals. She’ll spend an afternoon brainstorming exactly the meal we should eat that night, down to plating style and important condiments. She’ll decide on what complements what, and she’ll even head to the supermarket to pick up any ingredients we’re missing. And then she’s been known to direct once cooking is underway, making sure those at the stove and cutting board are remaining true to her vision. All these behaviors have earned her the nickname of Backseat Chef. I would like to clarify, though: while a Backseat Driver has connotations of annoying and overbearing, we do appreciate Jill’s involvement in developing the menus we eat. Since it’s nearing the end of the summer, we’ve exhausted the go-to grill options. Throwing on a big piece of striped bass and adorning it afterward with only grilled zucchini and perhaps some potatoes cooked in the embers isn’t quite as appealing in late August as it was in June. So we get creative. Or, more accurately, Jill gets creative. She first described this dish as fish wraps, and I turned my nose up. 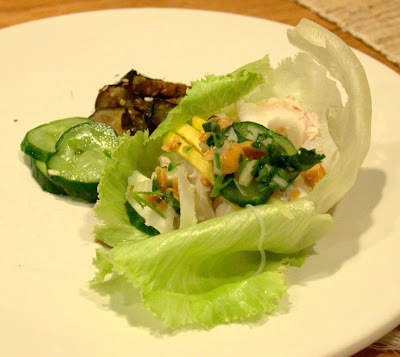 But then we revised the name as Lettuce Wraps, just lettuce wraps that happened to have fish in them. Jill dictated some of the necessary condiments, the rice noodles, the nuoc cham, and the crunchy cucumber salad. I added the eggplant, which was a variation on a dish I had wanted to make anyway, and I also threw together a peanut-cilantro relish, for beauty and added flavor. Everything was married by the juice of innumerable limes. Knowing what endpoint Jill had in mind somehow gave me the intuitive knowledge needed to fulfill her vision, despite never having made such a dish, or even such a cuisine (bastardized Thai-Vietnamese, or something like that). Rinse the lettuce. Carefully pull out each leaf and arrange on a plate. Cook the rice noodles as directed on the package. Drain and toss with the teaspoon of oil. Set aside. Poach the cod: arrange it on a steamer basket in a large pot over about 1 inch of boiling stock or water. If you don’t have a steamer basket, lay it right on in the pan. Cover and let cook 8-10 minutes, until opaque throughout. Carefully lift it out, but don’t worry if the fish flakes, since you’ll break it up for the wraps anyway. Garnish with a bit of lime juice and a sprinkling of Peanut Relish (see below). Put out the plate of lettuce, the fish, the rice noodles, and all the below condiments. Let each person load some noodles, fish, sauce, and whichever condiment she chooses onto the wrap. Pulse the garlic with the sugar in a food processor. If you don’t have one, mince the garlic, then sprinkle with about 1 teaspoon of the sugar and use it to pulverize the garlic while y0u chop. Add the lime juice and let sit for about half an hour so the garlic can mellow. Add the remaining ingredients and refrigerate until ready to use. Toss the onion with the lime juice. Let sit for about 30 minutes. Add the peanuts and cilantro and mix so the ingredients are distributed evenly. Toss the cucumbers with the salt. Let sit for about 30 minutes, then rinse. Wrap the slices in a dish towel and squeeze as much liquid as possible out of them. Combine the vinegar and 1 tablespoon of the sugar. Toss with the cucumbers and add more sugar to taste. Serves 6 as a side dish. Adapted from NY Times/Mark Bittman. Cut the eggplant into slices. Sprinkle with salt and let sweat for 30-60 minutes. Rinse and blot dry. Brush with the olive oil and grill as described in this recipe. If you have an outdoor grill, definitely use it. Meanwhile, toast the sesame seeds in a dry pan over medium heat until they are brown and fragrant. Mix them with the soy sauce and sugar. When the eggplant is done cooking, cut each round into slices about 1 inch wide. Toss with the soy-sesame sauce and serve at room temperature. Jill makes a mean spinach quesadilla, as I can attest! She is also a master planner as you describe. Pheobe and Cara, I am obsessed with your blog. To date I have made the carrot cake cupcakes and morrocan chicken stew to rave reviews. bravo! This was the best welcome home dinner I could ever have imagined. 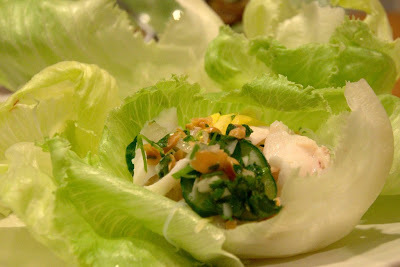 Also, nuoc cham is a great addition to any simply prepared chicken or fish. I can't speak for Jill or Cara, but as the resident carnivore, I think that ground chicken would be an excellent pairing. Larb Gai is a popular dish in Northern Thailand and Laos that combines cooked ground chicken with lots of lime juice and ground chiles. This would be great in the wraps, though I wouldn't make it as spicy as the Thai's do unless you are ading some sticky rice as well. Jenny–so glad you are enjoying! thank you thank you for following us!